On March 17th, lead by Vice Chancellor Ian Young, delegation of 11 people from Cloud Campus Alliance visited Central China Normal University. Vice President WANG Enke welcomed the delegation at Yifu International Meeting Centre and hosted a meeting afterwards. During the meeting, both parties had an amicable discussion on the internationalization and informatization of higher education. CEO of AEMG Mr. Roger Li and Director General Ms. Jenny Wang addressed to the counterparts in the meeting that the idea of Cloud Campus is resulted from the increasing number of joint education programs and students’ advancing requirements for subject numbers, teaching hours and education quality. As the council member of Cloud Campus, Central China Normal University will support its development both in hardware and software with all their efforts. Both parties hope that Cloud Campus can be a breakthrough to promote the integration of information technology and higher education. Cloud Campus is established by AMEG, with the purpose of launching a free platform for information sharing between universities in China and Australia. At the moment, there are 13 council members, including 6 Australian universities and 6 Chinese universities. Members of Cloud Campus are all contractors of Sino-foreign joint programs. They will share excellent recourses of courses, and make them available to students within the joint programs. 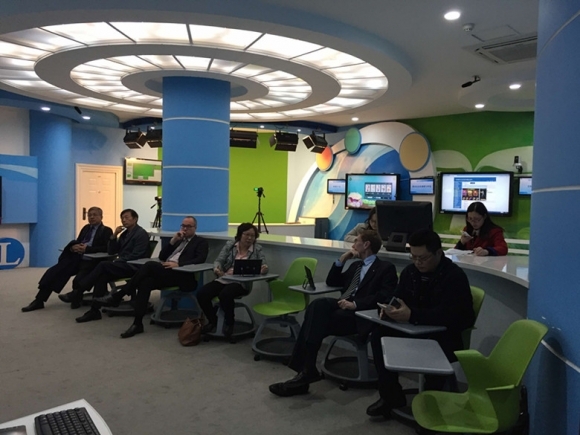 Delegates at the meeting said that Cloud Campus would promote students’ efficiency of study, create a new mode of intellectual cultivation, and promote the communication and development of Sino-Australian education.